The U.S. Department of Energy (DOE) Systems Biology Knowledgebase (KBase) is a knowledge creation and discovery environment designed for both biologists and bioinformaticians. We are excited to announce that the first generation of KBase's Knowledge Engine is online! This feature allows you to explore and discover all the data KBase has related to your organism. The Knowledge Engine builds relationships between all data in the system using both biological information, such as taxonomy, and data provenance to find and return the reference data, shared user data and Narratives on system related to your organism. The graphic shows above demonstrates the many data types found to be linked to a particular genome: related genomes, expression sets, models, alignments, and reads. Check out this feature on your own data by expanding the view on some data in the Data Panel of a Narrative, clicking the Explore data binoculars icon, and viewing the Similar Data panel in the Data Viewer. 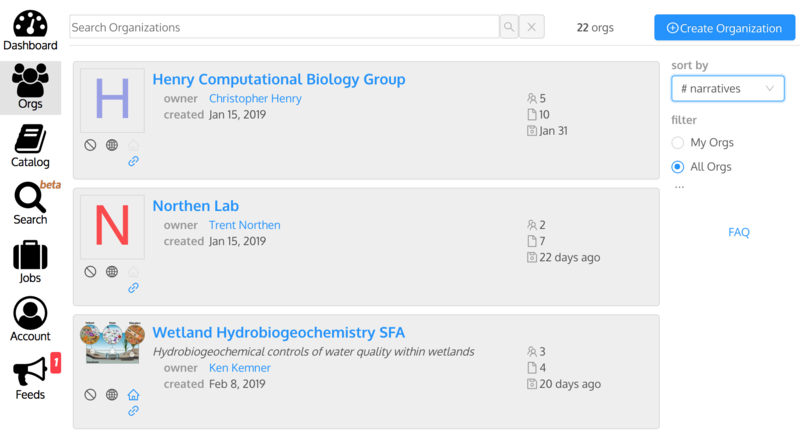 Another new feature in KBase is the ability to create Organizations for shared research, projects, and institutions. This allows collaborators to see each others Narratives and be notified when members of an organization add data or Narratives to the system. It also allows managers to track and maintain their project’s resources. Notifications for updates in your organizations and Narratives appear in the Feeds menu. You can track system updates, requests from other users, and more with this feature. Users often find links to Narratives in publications, or search and locate one of interest, but they don't have permission to access it. 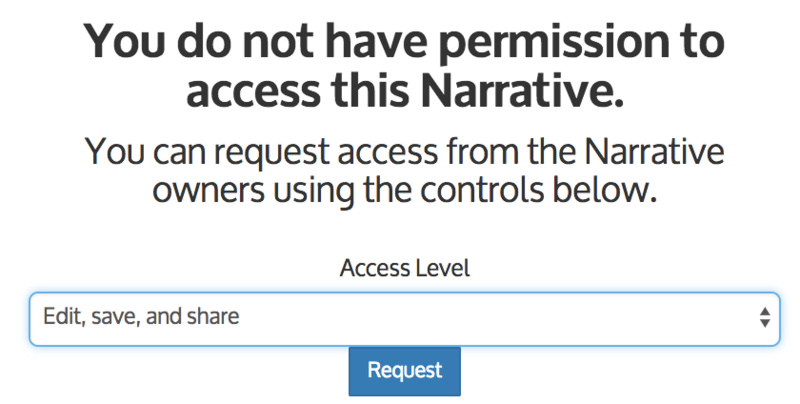 You can now request access to private Narratives when you locate them. The Narrative owner is informed of the request via Feeds.